As the sign which rules the winter solstice, Capricorn represents the triumph of light over darkness. With the Sun in practical and earthy Capricorn when you were born, you are both able and ambitious. You are no rebel and you usually have great respect for long-established customs and traditions. Like the sure-footed goat, which climbs the mountain peaks, you seek an elevated place in the society you live in and you usually succeed in reaching even your most difficult, ambitious goals. For your ability to work long hours and persevere, together with your well-developed sense of duty and commitment, and your vision, rarely let you down. What you build is built to last, and, as the sign that rules the winter solstice, when the Sun begins its rise towards the summer, it is usually both life-enhancing and creative. 2500 years ago, the sun reached its nadir at the winter solstice and then began its slow climb towards midsummer, in the sign of Capricorn, the Goat-Fish, one of the most mysterious and ancient symbols in the skies. For the Goat-Fish, known in pre-Babylonian times as 'The Antelope of the Subterranean Ocean', is the god Ea, 'He of the vast intellect', 'Lord of the Sacred Eye', who was worshipped in the Persian Gulf as the bringer of civilisation. He is said to have emerged four times, at long intervals, from the sweet, primordial waters of the subterranean ocean, which were seen as the source of all knowledge and wisdom, to teach men the arts of civilisation. When he appears, it is in human form, wearing a fish-tailed cloak. After educating mankind, he returns to the waters as darkness falls. The only one amongst the ancient gods who was always kind and never angry, Ea warned mankind about the Flood. Near his earthly palace on the shore of the Persian Gulf grew a great tree with leaves of lapis lazuli, which cast as much shade as a whole forest. It was only in later times that Capricorn became an earth sign and was associated with the Greek goat god, Pan. In astrology, Capricorn is ruled by Saturn. As the sign which dominates the cold and barren winter solstice, when the days start to get longer, Capricorn was the traditional sign in which the sun gods and redeemers were reborn to suffer the human lot and lead man to the light. However, if Capricorn is your Sun Sign, its ruler, Saturn, will also play an important role in your psychology. For the Romans, the god, Saturn, after whom the planet, Saturn, is named, was the ruler of the Golden Age, while to the Greeks, he was Cronos, the Lord of Time, with its great cycles of succeeding ages. The great ringed planet, Saturn, once marked the known limits of the solar system. Boundaries and self-discipline, as well as wisdom and stability, are its domain. It gives determination and endurance, and shows the way that you relate to responsibility and commitment. Its position at birth shows where both your hardships and your real strengths lie. As the planet of karma, and of limitations, inhibitions and boundaries, Saturn's sign and house position, as well as the links it makes to other planets in your chart, show where, and why, you lack confidence or are afraid, and where your real life lessons must be learned. Saturn slows down and inhibits any planet that it touches. It shows your relationship to authority and towards your standing in the world. Its position also reveals where, and how, you can realize ambitions and give your life a firm foundation. 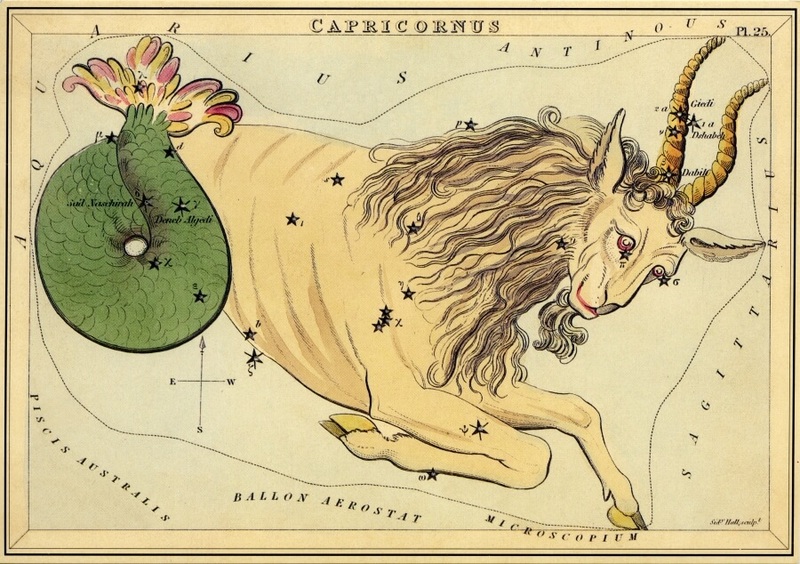 The stars of Capricorn are faint, the brightest being Deneb Algedi, which lies close to Nashira, and was seen as the "Fortunate One", or the "Bringer of Good Tidings", as well as being a star of "beneficence and destructiveness, sorrow and happiness, and life and death".  It is connected with law and justice, wisdom and leadership. Capricorn lies between Sagittarius and Aquarius on the zodiac band, in the 'ocean-oriented' part of the northern autumnal sky, along with Aquarius, the water bearer, the Whale, the Dolphin, the Southern Fish, and the two fish of the zodiac sign of Pisces. It can be seen in early autumn in the northern hemisphere, reaching its highest point at 10 p.m. on 1st September. In the northern hemisphere, it is low above the southern horizon. From the southern hemisphere, it is high in the northern sky in spring.